Adjust oven rack to middle position and heat oven to 200 degrees. First, halve each chicken breast into 8 cutlets. Pound each cutlet into ¼ thicken and pat dry with paper towel. Season the cutlets with a little salt and pepper and set aside. 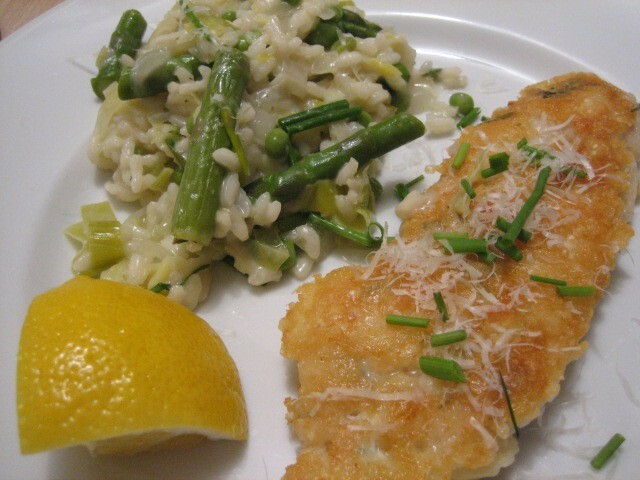 In a shallow dish combine the 1 cup of flour and the ½ cup of finely grated parmesan cheese and set aside. In another shallow dish whisk 5 Tbs of minced fresh chives and 5 egg whites and set aside. In a third shallow dish combine the 4 cups of large grated Parmigiano-Reggiano cheese and 4 Tbs of flour and set aside. Heat 1 teaspoon of olive oil over medium heat using a nonstick skillet. Prepare the first two cutlets by first coating one at a time in the flour mixture, shaking off excess flour then dipping in the egg white mixture and then coating with the largely grated Parmigiano-Reggiano flour mixture and placing two prepared cutlets at a time in the heated skillet. 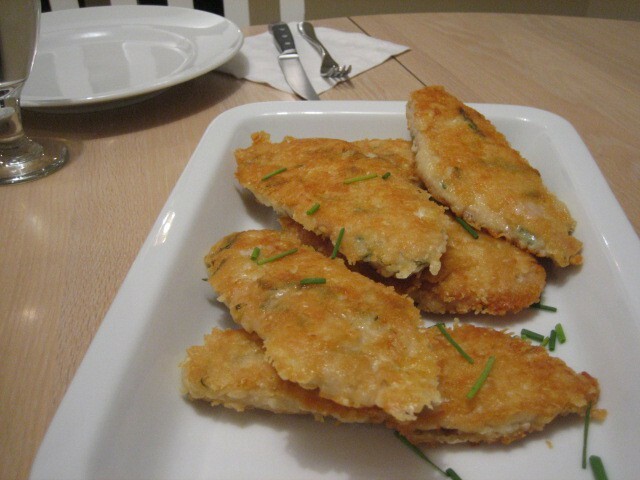 Cook the cutlets until cheese is a golden brown, about 4 minutes on each side and is cooked through. While the chicken is cooking, make sure to keep the cutlets separated or the cheese will fuse them together. Use a non stick spatula to keep them apart. Transfer chicken to wire rack set in rimmed baking sheet and keep warm in the 200 degree oven while you repeat the process three more times to complete the remaining 6 cutlets. Using tongs and a paper towel quickly wipe the skillet clean before repeating the process to start with fresh olive oil to prevent burning. When all the cutlets are prepared remove them from the oven and sprinkle the remaining Tbs of chives and serve with lemon wedges immediately.